“Straight talk, real issues, honest answers.” That is what participants can expect at the first ever Guts Conference at Grace Community Church, a Grace Brethren church in Goshen, Ind. Throughout the day, they will also take questions via text messaging, which Brown says will be answered by a panel of six men on staff at the conference. 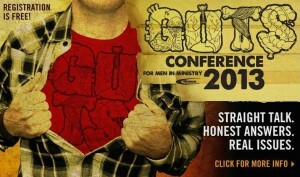 Lunch will be provided, as will a complimentary Guts t-shirt and a Guts Kit. Registration is required, but the conference is completely free.